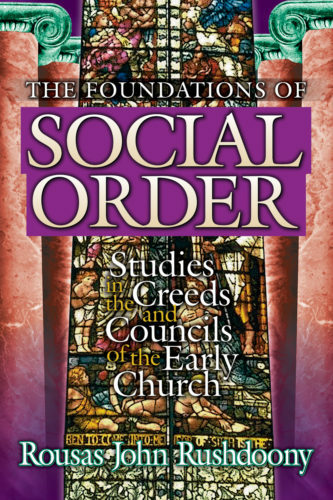 "The Foundations of Social Order was, and remains, the most unique book ever written in the history of Christendom. Nothing like it has been written before, and nothing like it has been written since. Christian and non-Christian historians have generally agreed on at least one thing about creeds and history: they are not connected in any meaningful, comprehensive way. A few non-Christian historians-Harold Berman and his Law and Revolution being a good example-have mentioned that the Christian creeds have been instrumental in shaping the legal views and therefore the legal structure of the West. But a general study of how the creeds formed the West and its unique outlook has always been lacking; the reason being that both Christian and non-Christian authors are eager to constrain the significance of the creeds to the church and the history of theology. Even Philip Schaff in his three-volume work, The Creeds of Christendom, confines their value and use to the church. The view of the creeds has been dualistic; creeds were separated from history, and history was left to follow its own course, independent from the development of Christian theology and the perfection of the faith of the saints.